I’m not sure I had ever actually had chicken tetrazzini until just recently. We had an assortment of pasta dishes at the shower I helped host this weekend, and one of the other hostesses put this dish on the menu. Ever since Saturday night I’ve had the itch to make it, and while I knew it would be ambitious for a week night meal, Blake was home tonight and so I thought what the heck. Totally worth it. This is a Giada De Laurentiis recipe. I stayed pretty true to the original, but due to some of the quantities I had on hand (and the fact that I messed up a couple of steps), I veered ever so slightly. I am sharing the way I made it because I can personally attest to the fact that it tasted really, really good. I will definitely make this again, and it has potential to be a great care package meal too. Hope you enjoy! 2.) Add 1 tbsp of butter and olive oil to large dutch oven. Add mushrooms and sauté until any liquid is cooked up and mushrooms are golden. Add onion, garlic and thyme. Saute for another 2 or 3 minutes. Add wine and chicken stock. Saute until liquid is mostly evaporated. Remove from heat and stir in shredded chicken. 3.) While the mushroom mixture is cooking, boil linguine in a large pot of salted water for 10 minutes. Set aside when done. 4.) In a separate large sauté pan, heat remaining 4 tbsp butter until it is melted. Add flour and cook for about 2 minutes, stirring constantly with a whisk. Add milk, heavy cream, salt, pepper and nutmeg. Bring to boil, stirring frequently. Once sauce has thickened (about 8 or 9 minutes), remove from heat. 5.) In the largest pot you used, add pasta, mushroom/chicken, cream sauce, peas and parsley. Stir until well combined. Pour into a 9″x13″ casserole dish. 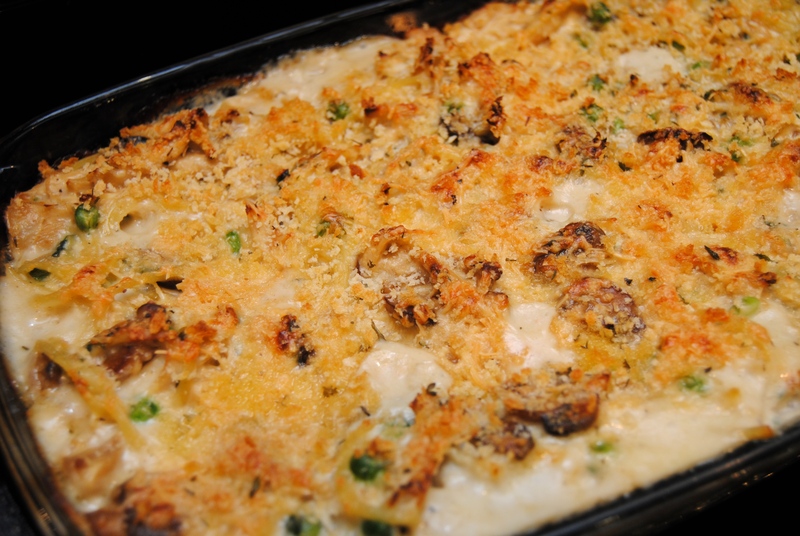 Top with parmesan cheese and then Italian breadcrumbs. Bake for 20 to 25 minutes or until bubbly and the top is golden brown. 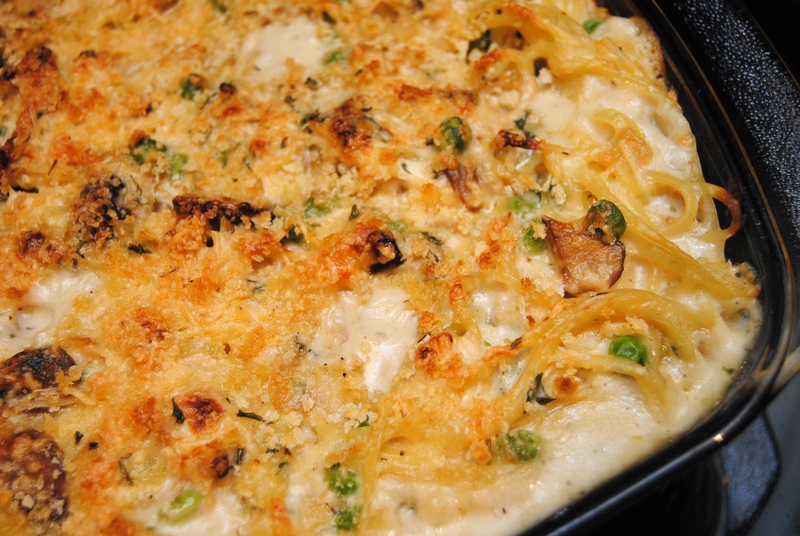 This entry was posted in Food and tagged Casserole, Chicken, Cooking, Cream sauce, Italian, Linguine, Mushrooms, Peas by biscuitsncrazy. Bookmark the permalink.